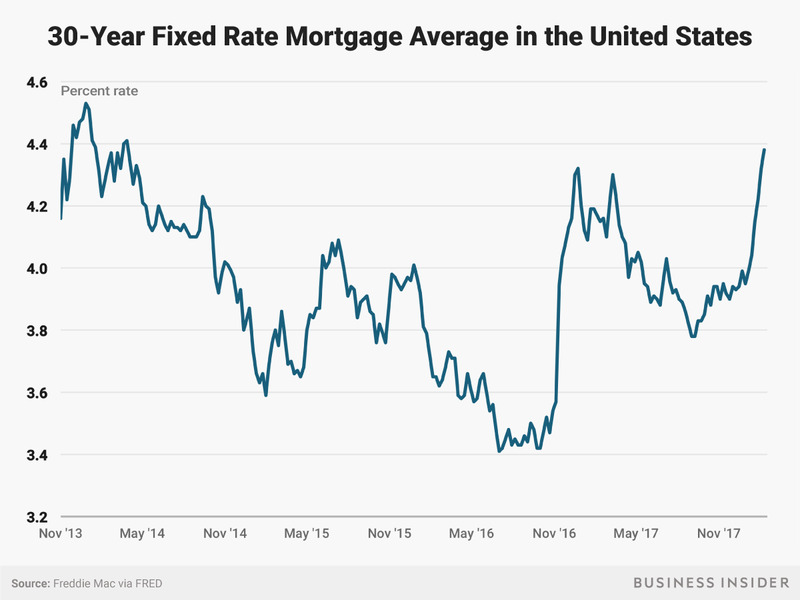 Mortgage rates have climbed to a two-year high. What’s different about this rise is a growing concern that borrowing costs are more likely to continue going up. The recently passed Tax Cuts and Jobs Act created anxiety about housing, since it reduced some of the benefits that homeowners enjoyed. However, the impact from the new tax law is most severe for high-priced homes, which make up just a minority of the market. A bigger issue for most homebuyers is that interest rates are on the rise. Or, at least, there’s a growing consensus the era of being able to count on interest rates to stay low is nearing its end. For prospective homeowners, that means financing a mortgage could become more expensive over time. 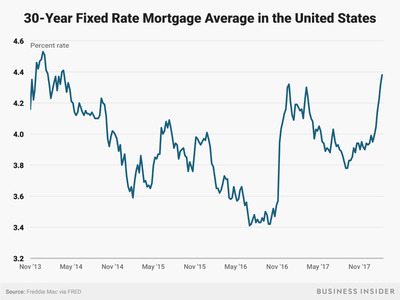 “A lot more people are cognisant of interest rates than in the last 12-24 months,” Noah Goldberg, a real estate agent in Hoboken, New Jersey, told Business Insider. The good news, according to Goldberg, is interest rates alone don’t determine the decision to purchase. People still want houses they hope would appreciate with time, and that they can take pride in. But he anticipates some shoppers would need to settle for properties in the lower end of their budgets. “More than anything, people are going to jump off the fence because of interest rates picking up,” said Jason Cassity, a real estate agent in San Diego. On Wall Street, investors are bracing for higher inflation, as the federal government stimulates the economy by cutting taxes and raising spending. That means the Federal Reserve may have to raise borrowing costs to reduce the risk of consumer demand running too far ahead of what the economy can produce. And that would mean higher mortgage rates. These expectations have already bumped up mortgage rates in 2018. According to Bankrate.com, the average US 30-year fixed rate rate was 4.33% on Friday, up from 3.85% on New Year’s Day. That’s a two-year high, but still well below the 6%+ rates that were charged before the housing crisis. And zooming out even further, rates remain historically low. It’s one reason why demand is still strong. Kalena Masching, a Redfin agent in Palo Alto, California, saw 44 offers on one house last week, for example. That doesn’t negate the fact that a rising-rate environment makes waiting out on homebuying more expensive. “The people not paying attention are those who bought in the 1980s and 90s when interest rates went over 20% and spent most time in the double-digits,” Masching said. But even with a favourable rate, the biggest challenge for a lot of buyers remains finding a house within their budget. The most affordable starter homes are rising in value faster than luxury properties, and have been for at least five years, according to a Zillow report released on Friday. That’s in large part because affordable houses are in short supply.